Restaurants open. Restaurants close. Some operate for an eternity while some last as long as a cup of coffee. There are name changes and changing of hands. Sometimes, a restaurant may relocate or close for awhile and reopen down the road. Now, how about a restaurant that has moved a total of 4 times, maintaining the same name and employees? That would be The Roc. 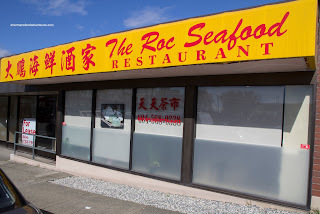 A modest Chinese restaurant that began its existence on Kingsway at the terminus of King Edward. 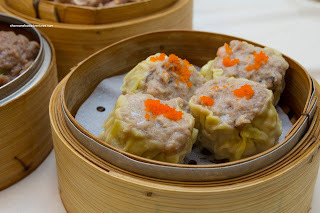 We would frequent it for Dim Sum as their prices were rock (pun?) bottom while the food was more than acceptable. Then they moved further East on Kingsway where Po Kong sits today. Then all of a sudden, we found them located at the corner of Cambie and Marine. They had to vacate shortly after because the building was slated for demolition to make way for a condo project. Now, they took over the location of the former Penny Pub on Main and 41st. After a warm, but interesting visit to the Bloedel Conservatory, we made the short jaunt over to the current location of The Roc. Gone are the push carts and in with the ever-so-familiar order sheets. 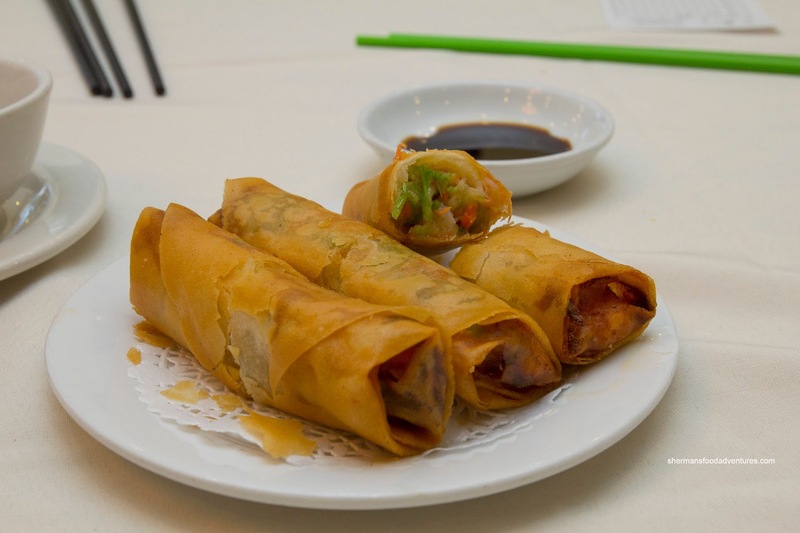 The first item to arrive was the Spring Rolls. This was a mostly veggie version with tiny bits of shrimp hiding within the predominantly celery and carrot filling. The overuse of celery made the roll taste a bit funny and too wet. Otherwise, the outside was crispy and not overly greasy. And as with most Dim Sum service, the dessert showed up next. 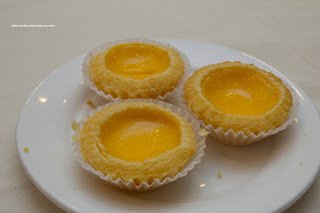 The Egg Tarts were flaky and buttery (or lardy?) with a semi-sweet filling. For aesthetics, the tart shell could've used a bit more browning. Up next was the Shrimp Rice Noodle Roll, which was decent. 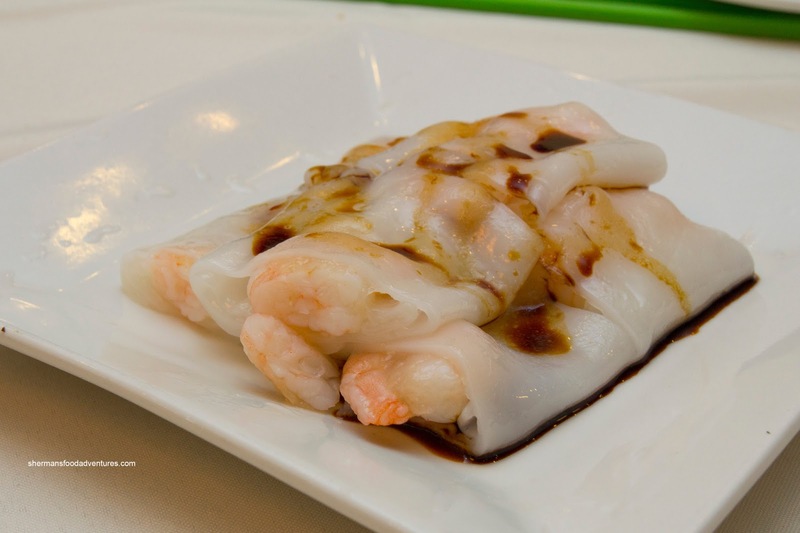 We found the rice noodle beautifully constructed being thin, soft and retaining a slight elasticity. The whole shrimp filling was adequate and had a nice snap, but were devoid of any seasoning. With an attractive dusting of fish roe, the Sui Mai were big and meaty. There was little else other than lean pork in the filling which meant it was rather dense and stiff. 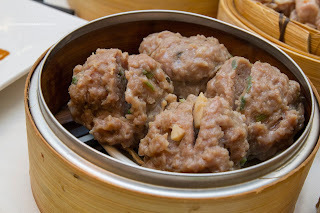 Flavourwise, it was on the sweeter side in need of more savoury elements (maybe more shiitake?). 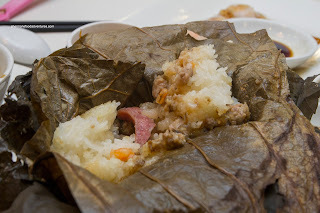 Onto a kiddie favourite, we had the Lo Mei Gai (Sticky Rice wrapped in Lotus Leaves). 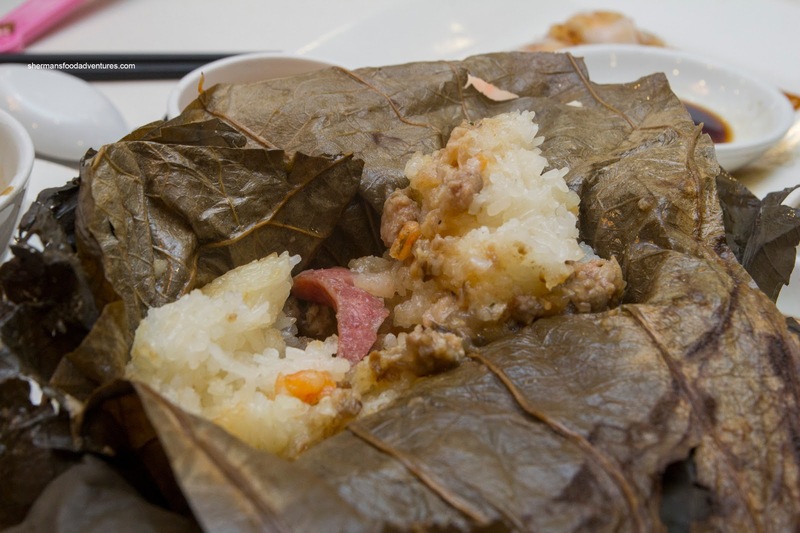 We found the rice to be a bit stiff, but the plethora of moist pork alleviated it somewhat. As per my modus operandi (wooo... big words! 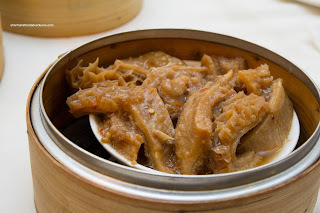 ), I went for the Honeycomb Tripe laced with a good amount of garlic and a touch of spice. I liked how it was flavourful without being overly salty. In addition, the tripe was soft (but not mushy) and not gamy tasting. Moving onto another must-have in my opinion was the Black Bean Spareribs. This was a fairly large portion with chewy (in a good way) ribs. We liked how there were very few cartilage pieces as well. The entire dish was garlicky with some spice, yet mild at the same time. There was very little black bean as the picture suggests. 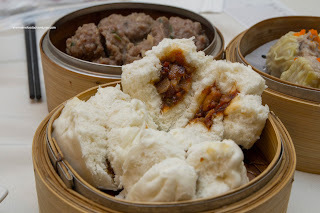 For some reason or another, we ordered the BBQ Pork Buns (which we've done each of the last few times). We never seem to finish them and the kids are usually somewhat mildly interested. We found these to be stiff and dense. However, the filling was meaty (not fatty) and mixed in with a sweet glaze. Moving onto some Beef Meatballs, they were big and barely fit onto the plate. They had a nice meatiness to them with a slight bounce texture. There was a good balance of water chestnuts and green onion, yet the mix could've used a touch more fat. 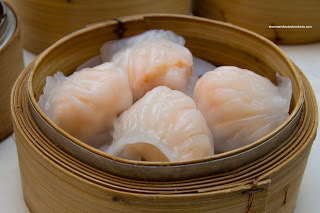 The Haw Gow (Shrimp Dumplings) took forever to arrive and it appeared that they had given our order to another table. Interestingly, the lady who made the mistake was scolded right in front of us. Kinda awkward... Anyways, the dumplings were a touch oversteamed which made the rice flour wrapper wet. 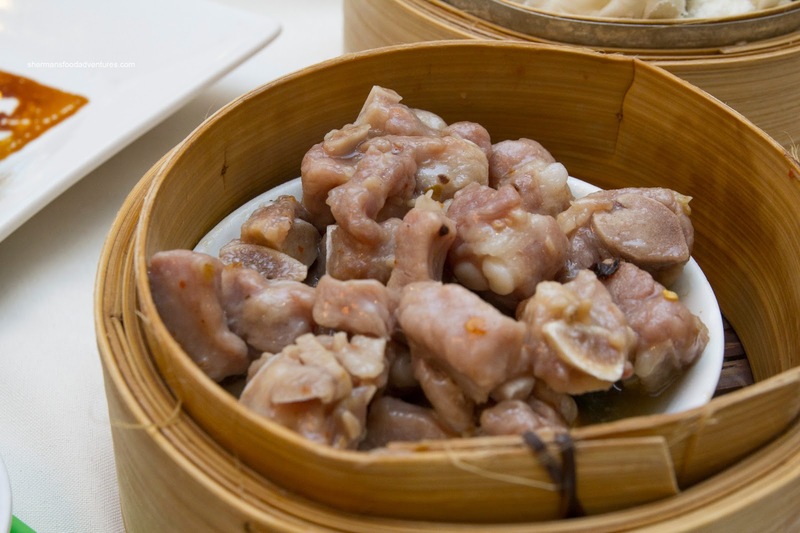 However, the whole shrimp filling had a good snap and exhibited a mild natural flavour. All-in-all, a very acceptable meal considering the reasonable prices. 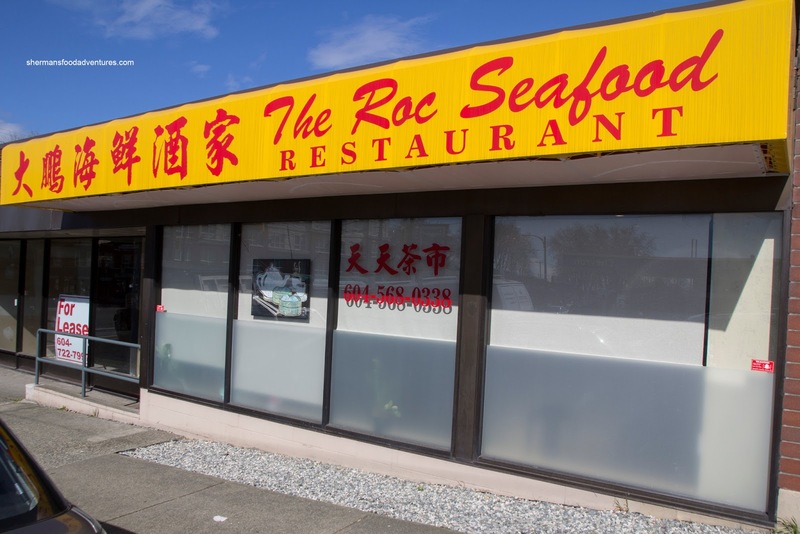 Although they have moved for the 3rd time, The Roc continues to offer up good value eats in a now cleaner environment. My parents go there weekly, always looking for excuses to "yum cha". They like the place (yes it's cramped and fills up quickly). The blanched gailan (lunch small plate serving) is very very good. Most other dim sum offerings are more than decent, and good value too. And parking ..... easy and ample, right Sherman ?